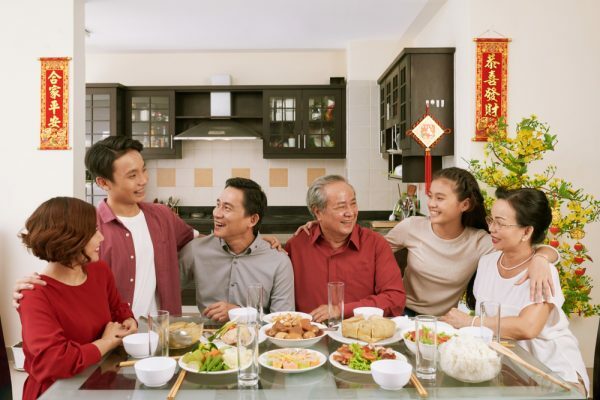 Chinese New Year dinner has always been about family time with home cooked meals. Or at least that was the plan, until restaurants started offering a fuss-free experience with their Chinese New Year menu. But the whole point of cooking Chinese New Year dinner is to save money. However, if you’ve actually tried to do it, you’ll realise even cooking it yourself is far from cheap. That’s what comes of living on an island, where almost every ingredient is imported. Don’t worry though, GoBear has you covered. So for that homely touch, minus the pain to your savings, here are some money hacks and at the same time let you enjoy a feast. If you’re an experienced cook, you know what’s going to hit a sky-high price around Chinese New Year: rabbit fish (or white belly). Prices have been known to hit $80 a kilogram. Some of us have yet to recover from the trauma in 2015 when the prices went up to $100 a kilogram. First, they’ll trust you enough to reserve it for you, thus ensuring you can get it in the first place. Many will give you their contact number, so you can “book” the fish ahead of time. Second, you’ll get it for a lot cheaper than the faceless throng who are doomed to pay absurd prices for their fish. Consider, for example, this writer’s uncle, who got it for $40 a kilo when the price was at $100, just because he was chummy with the fishmonger. If it’s too late for you to get familiar with them this year, start buying from them right now. It’ll pay off next CNY. Cooking is cheaper overall, but this isn’t true for every single dish. The zhi-char stall below your flat, or a nearby restaurant, has deals with food suppliers that you don’t. Sometimes, it’s cheaper to buy their abalone or fish-maw dishes, than to make it yourself. In particular, certain run-of-the-mill dishes (like seafood hor fun) might be much cheaper to buy than to cook by yourself. Besides, stores tend to give you value-for-money when you order large portions. So always compare the prices of your raw ingredients versus the prices of buying ready-made food. Don’t assume restaurant-bought is always more expensive. Besides, buying ready-made dishes will give you more time (and kitchen space) to prepare your centrepiece dishes. The most popular wholesaler for dinner ingredients is probably Victoria Wholesale Centre. However, don’t neglect others such as Fassler Gourmet. Buying from a wholesaler is almost always cheaper, as there’s no middleman involved. Prices tend to be cheaper by about a third of the normal price, although you do have to buy in much bigger quantities. That’s not a problem though, if you’re buying enough to cook a giant dinner. While you’re looking up wholesalers for ingredients, don’t forget to get your various snacks from them as well. Everything from love letters to ground nuts are cheaper from wholesalers; and some wholesalers only sell to the public during the CNY season. There’s no point using, say, your petrol credit card to buy groceries from Sheng Siong. You probably get nothing from that. Remember, this is a mode of payment, not a loan. Just remember to repay your credit cards in full, or else the interest will eat up any potential savings. Just about every househusband or housewife knows this method; but if you only make a big dinner once a year, it may elude you. “Plan-by-Ad” means you browse around for what’s on discount first, and then plan the CNY menu around that. Don’t worry about getting “wrong” dishes, as almost every food seller will cater to the CNY demand with their promotions anyway. There are mock vegetarian counterparts to things like abalone (check out Fortune Centre for supplies). There’s no need to be ashamed of using these. First, you’d be surprised how many people can’t tell anyway. The true gourmands will know, but they’re always going to be in the minority. Second, insisting on using “the real deal” will mean compromising elsewhere to fit the budget. It’s silly to skip the fish-maw soup that will feed 10 people, to buy enough pricey abalone to feed three. Besides, have you seen the prices of abalone during Chinese New Year? No thanks. The surest way to overspend is to let your culinary passion drag you off course. Always have a clear budget before you begin – if you want to add something new to the list of dishes, something equally priced must be taken off. Otherwise, you’ll keep piling food into your trolley / hand-basket, and end up with enough leftovers to make next year’s dinner. We’ve all been in situations where we’re eating the same food for a week after Chinese New Year is over, because the cook went overboard (some of us never learn, and keep doing it every year). Most people buy more than they need. So keep that in mind, and shop with a fixed budget. Mobile trading — so easy, you can trade anywhere!